FIRE BREATHING CHICKENS! Got your attention? 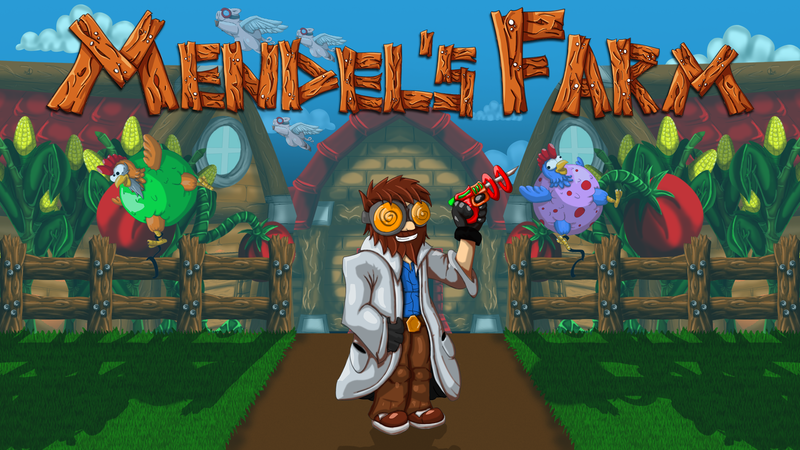 Mendel’s Farm is a quirky life/farm sim game that tasks you with assisting the crazy scientist Mendel in running and managing a farm of mutated livestock and crops. There are many tactics that the player can use to do this, with a goal of ours being that each player is able to have a unique story when playing the game. With many tactics, and millions of variations of mutated animals to pick from, the player can personalize their farm to suit their requirements. Annoyed by that fox that keeps stealing your chickens? Well, it wouldn't steal a chicken that could breath fire now, would it? This is just the tip of the iceberg in the crazy little game that is Mendel's Farm. Mendel's Farm targets Steam Greenlight and goes to EGX London! We will be uploading the build we took to EGX soon if anyone would like to test it or missed out. The demo build will be about a 10 minuet condensed chunk of Mendel's Farm to give an idea of what the game will be like. A much more stable version which will allow for a longer game-play experience will also be released soon once we are certain that everything is as unbreakable as possible! That said, every time we think we have found every bug and hit upload, another one always seems to surface... But i guess that is part of the fun! What exactly have we changed? Quite a bit! We have added many things ranging from Genetic Modification, Livestock Diseases, Pleiotropic Effects (hidden, or bonus mutations), as well as an improved Missions user-interface. It does not stop there, there is also the addition of "Today's Pick" in the market, a new Random Event and last but certainly not least, a brand new animal. The glorious Cow! Naturally, with the cow comes a collect-able bucket of milk that the player can gather and sell as well as a unique home for the cow. That summary was a little vague, so allow me to go into more information about each change or addition. We have added Genetic Modification to the game. After some feedback we decided this is something we should certainly add. The player can now select an animal, drop it on their laboratory and begin the modification process. If they have discovered a mutation they will be able to add this mutation to their current animal. If they have not discovered mutations there are ways to research them. A more in-depth description of how Genetically Modify livestock can be found here. We have also added a range of diseases to the game, Some... interesting conditions such as the dreaded "Fart Virus", or the forever feared "Spontaneous Avian Combustion" disease. With a range of unique illnesses to different livestock there will now be consequences if animals are not properly taken care of. Additional Pleiotropic effects have been added to the game. These work as our special or secret mutations which occur if certain conditions are met. Fire-breathing is an example of this, for example an animal will only breath fire if it happens to have mutation x and mutation y. Do you think you will be able to find all the special mutations? An improved missions user-interface has also been created. This will replace the old missions user interface that was clunky and confusing. The new system gives the player a range of tasks to pick between and take them on one by one with accurate rewards. (No more trading 10000 eggs for 2 manure!) These tasks will refresh every evening and be a consistent source of rewards and income for the player. We have added "Pick of the day" to the market which will allow players to sell specific items for an increased profit. Benefiting players that decide to stockpile a resource for that special day when they can sell it for 200% of its normal price! Saving up this many resources does have it's own risk, as random events will always be around to take advantage of the vast number of easily stolen resources. We have also added a new random event! The mole has been added to the game. This little critter will burrow around the farm and occasionally cause a poor animal to fall into a sinkhole. (unless they can fly to safety) It will be up to the player to whack that mole to defend their livestock. We will do another update soon covering how we created this little guy. More information about the cow? Well, I could tell you about all the new mutations, but It would be much more fun to upload a demo of the game and let you experiment with all the new additions we have added! Let it be known that the cow is quite the monster in terms of potential mutations and has set the bar that all future animals will have to meet to be accepted onto Mendel's Farm. We are sure you will have fun in discovering all the crazy combinations, and be sure to let us know your favorites. If you have any ideas for mutations for the other animals, we are always looking to expand our pool of mutations! One last thing... We are targeting Steam Greenlight! If you would like to vote for us, it would help us out immensely, both with motivation and progress towards our end goals. (and we would love you forever) We are very excited for this as we cannot wait for all the feedback. There is so much to do, so much we want to improve and so much we would like to test. We want to make this game the best it can be, and the more eyes on it giving us feedback the better! The game is certainly not finished yet, but we hope people will see its development over time as we are on Steam Greenlight and with our continued effort and progression proceed to craft Mendel's Farm into a "yes vote" worthy game! There is so much on our to-do list that i think this would probably deserve its own news update. Covering what we want to tackle next and what we think we should focus on and what you, the players, would prefer to see. Alas, that is a post for another day. One last time, if you would like to be even more epic, vote for us here! Thank you and I hope you enjoyed this update! Mendel's Farm Beta v.02 - Come play! Development of the Fox Random Event! Mendel's Farm - Development of critters, this time the Butterfly! This is a demo of Mendel's Farm v0.4.3, which allows you to have a taste of what the game has to offer. Leave any feedback in the comments section below! That's good to know. BTW game is very specific and you don't see many like this one did you consider going through kickstarter. I think that could generate some more interest in the game and maybe some founds to speed up production. Do you have any estimate release date? Umg. The trees gave me tears. How someone could update trees in a game... It's inspiring. And the difference... srs tho! haha, now would that be a rabbit that thinks it's a horse or a horse with a very rabbity mutation xD?